Rindt print shop in Fulda has been using the new Versafire EV from Heidelberg for a number of months. Sören Plur, PrePress Team Leader at Rindt and Heinz Höfler from Heidelberg Sales Germany. The European launch of the new Versafire digital printing generation took place last past spring. Heidelberger Druckmaschinen AG (Heidelberg) launched two new models on the market: the Versafire EV is a flexible production system that is ideally tailored to the requirements of the graphics industry thanks to its creative applications, and enables extended business models, while the high-performance Versafire EP production system scores with stability and maximum performance at high volumes. In summer 2018, the new Versafire models celebrated their premiere in Heidelberg USA’s Print Media Center Atlanta. The visitors were enthusiastic about the new functions, and impressed by the two presses’ price-performance ratio. The Commercial Days in the Print Media Center Shanghai in October 2018 marked the launch of the presses on the Asian market, where there was also great interest in the Versafire EV and EP. The new presses are now installed and in operation worldwide at many Heidelberg customers. One of the first production Versafire EV presses has been in use at Druckerei Rindt GmbH & Co.KG in Fulda (Hesse) since April 2018. Managing Director Sebastian Jerabeck had spent years looking for a suitable digital printing system to round off the offset printing offering and provide extended services to customers. His initial experiences with digital printing systems from other manufacturers were less than satisfactory. - We regard digital printing as an important part of our offering, we want to use it to round off our portfolio downwards and print short runs, says Jerabeck in summing up his requirements. - The Versafire EV was the only press to hit the mark for us: the print quality is so good that there is very little difference between the digital and offset prints. A good color management system means that products combining both methods can also be produced, confirms Sören Plur, PrePress Team Leader. Rindt print shop regards itself as a problem solver and relies on individual consulting services, especially for complex printed products. This philosophy is paying off, with the company growing since its establishment in 1931. 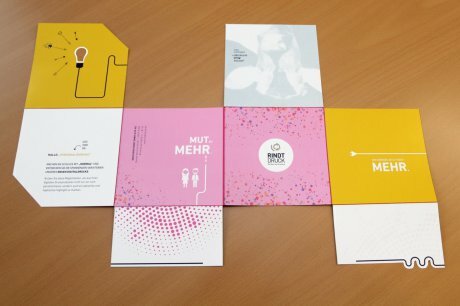 A mailing showing the creative possibilities of Versafire EV with opaque white, coating and neon pink is sent to Rindt's customers. It invests in the latest printing technology every two to three years, and is planning another production expansion in the offset printing sector for this year. - We have a broad-based market presence and can rely on our more than 70 employees, who are among our most important assets, says Jerabeck in explaining his recipe for success. The full-service print shop operates in three shifts, with 80 percent of its deliveries going to German customers, as well as to Austria and Switzerland. Three quarters of the printed products are traditional commercial jobs, however, the company also produces packagings, which is where it is experiencing the strongest growth. The discerning customers come from industry, banks, insurance companies, publishing houses, and advertising agencies. - We regard ourselves as a partner to our customers. For example, a few years ago we repositioned our print shop by relaunching our brand – moving away from the standard print shop and towards a problem solver, and are therefore less replaceable, explains Jerabeck. The services for customers are constantly being expanded and now include warehousing and logistics as well as private web stores for major customers. From business cards to advertising material, they can order everything directly online there. Rindt print shop also wants to extend its portfolio with the Versafire EV. It uses an unusual mailing showing the creative possibilities of the press with opaque white, coating, and neon pink to inform both its regular customers and new customers. - We want to give our customers the best service, and are therefore investing again in the latest technology, confirms Jerabeck. - We were impressed by the overall offering with innovative technology and the best service of Heidelberg.